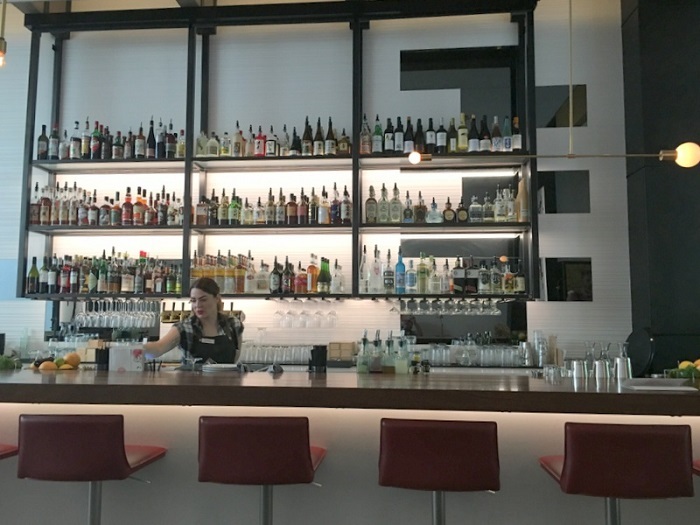 It’s been a long time coming, but Post Office Place (16 W. Market St, SLC) – a new bar created by the owners and staff members of Takashi restaurant – is finally open. And boy, was it ever worth the wait! Takashi owners Tamara and Takashi Gibo took over the space adjacent to Takashi restaurant – former home to Kristauf’s Martini Bar – well over a year ago. 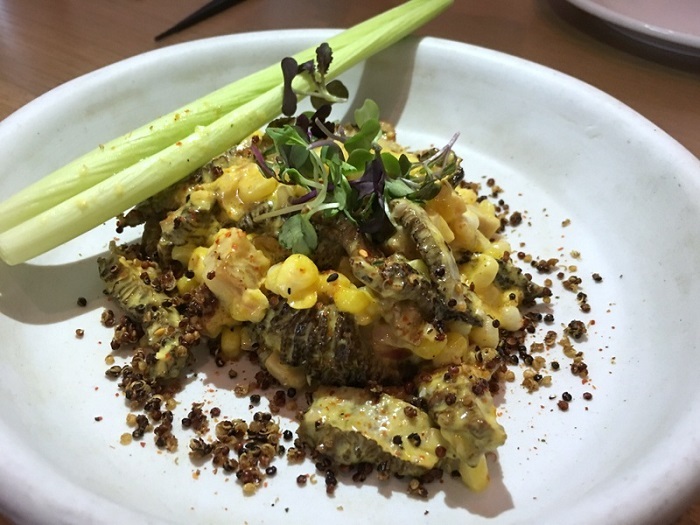 That’s when Takashi first told me he and Tamara were planning to open a bar that would feature, not sushi (which Takashi is known for), but an eclectic mix of Peruvian- and Asian-influenced cuisines. To help execute their vision, they’ve put the very talented Tommy Nguyen in charge of the kitchen – a small space that dishes out big flavor. Tommy is a former Takashi chef and also did a stint at Rye Diner & Drinks, when the food there was rockin’. As you probably know, Takashi restaurant is packed pretty much every night of the week that it’s open, beginning at 5:30 when the doors are unlocked. There is always a queue out on the sidewalk of folks looking to commandeer a prime table or seat at the sushi bar. So, Post Office Place was conceived, in part, as a place where customers waiting for a Takashi table could enjoy an adult beverage without being required to purchase food. But here’s the thing: You’re going to want to eat at Post Office Place because, like at Takashi, the food is superb. It may be a bar, but this sure isn’t standard bar food. 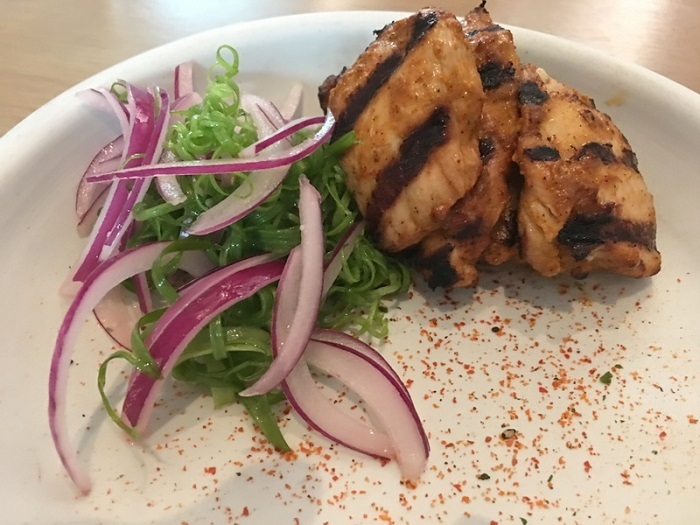 A native of Japan, Takashi Gibo lived in Peru for many years and the new Post Office Place menu is chock full of Peruvian flavors. That includes items like ceviche and grilled meats accompanied by traditional Peruvian sauces and condiments. These are “small plate” offerings, with prices ranging from $4 to $13. The latter, by the way, is for a $13 California Roll made with real King crab (the only sushi item on the menu). 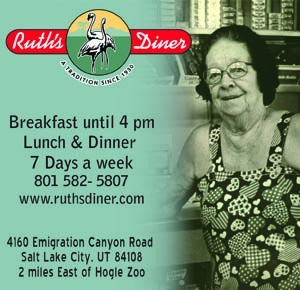 The menu is divided into two sections: “Hot” and “Cold” dishes. Most, with the exception of the single-serving tuna tartare ($4), are plenty generous enough to share. More about the food in a bit. I have to comment on the decor, which is drop-dead gorgeous. There is a spacious, yet minimalist look and feel to the design of Post Office Place, with sleek lines and stunning, well-placed art – not too much, not too little. 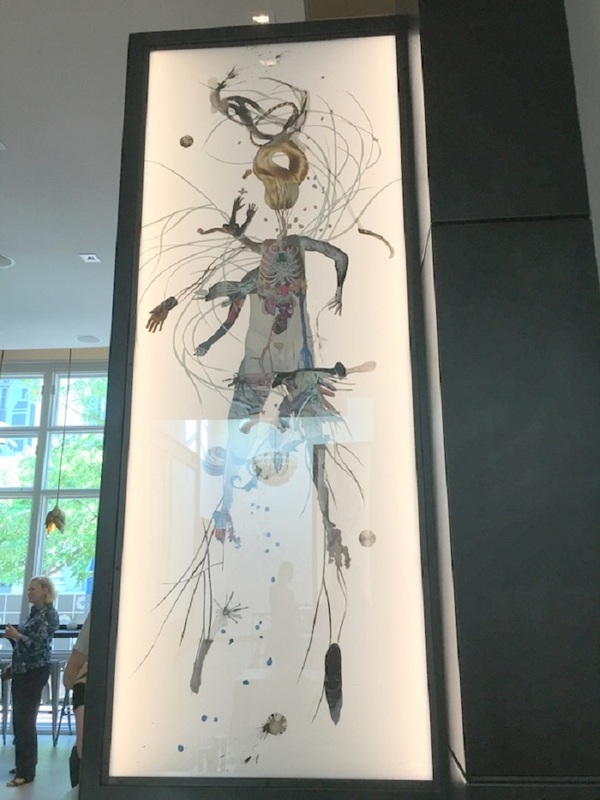 There isn’t a trace of the original Kristauf’s decor left, and while there are allusions to Asia here and there – like a tatami-style wall that separates the kitchen from the dining area – overall, the look of Post Office Place, like the cuisine, is unique, contemporary and eclectic. Of particular note is spectacular backlit art by Gary Vlasic, who was commissioned to create wall art for the bar. We were treated to a superb off-menu dish to kick off our meal, and one that I hope makes it onto Chef Nguyen’s regular menu. 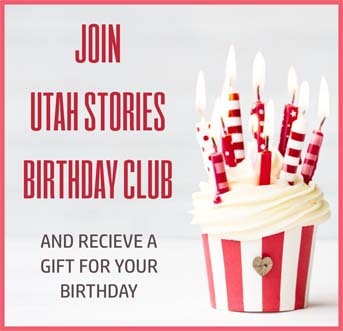 It was a sumptuous melange of fresh Utah corn and morels with bits of pork belly in a heavenly sherry-cream sauce. But that was just a hint of the good things to come. 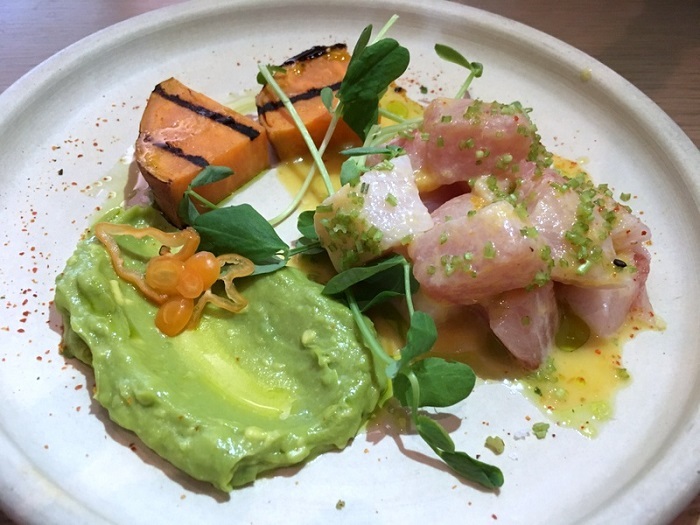 From the “cold” side of the menu we opted first for Hamachi Ceviche ($10), which is served with Peruvian-style aji amarillo and leche de tigre, along with grilled yams. Leche de tigre (tiger’s milk) is a classic citrus-based, spicy marinade used to cure the fish in ceviche – hamachi, in this case. Aji amarillo refers to the yellow-orange chiles used for the sauce that accompanies the ceviche. All together, this is a sublime dish with sauce subtle enough not to mask the light, elegant flavor of hamachi. 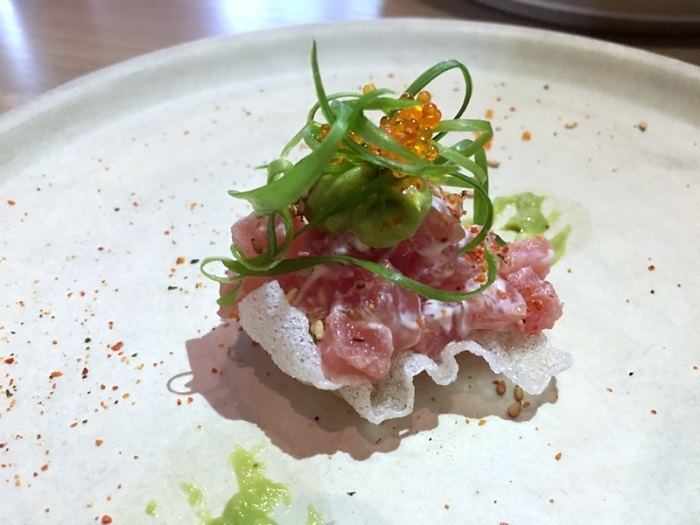 We didn’t get to it on this visit, but I’m keen to try the Beef Tartare ($15) with quail eggs and aji panca, and also the Piquillo Relleno ($7) – piquillo chile with quinoa, shiso and Mexican cotija cheese. 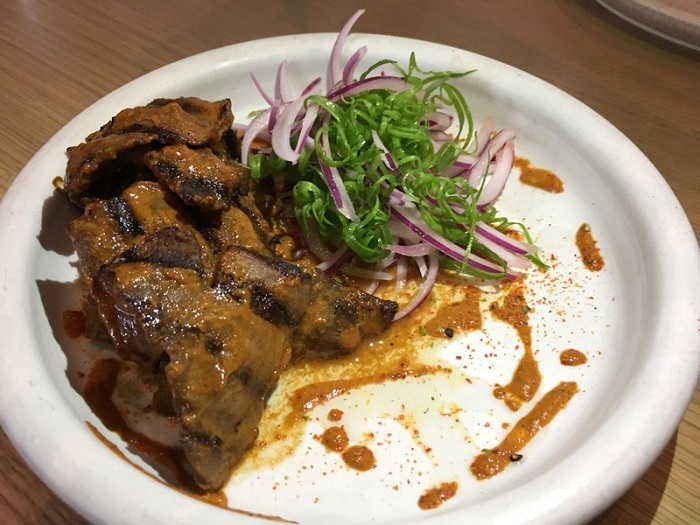 Turning to the “hot” portion of the menu, we first enjoyed grilled, sliced beef heart (Beef Haru Maki) with aji panca, rocoto (a hot Peruvian chile pepper) and red onion-scallion “slaw.” The perfectly cooked beef reminded my wife of flank steak (one of her faves). My only suggestion is that you might want to ask for a fork and knife if you order the beef heart, since it’s a bit chewy and, at least with my inferior skills, was difficult to manage with chopsticks. Antichucho al Pollo ($8) is super-tender grilled boneless chicken thigh, which Chef Nguyen was kind enough to serve with its cilantro sauce on the side (since I’m no fan of cilantro). It, too, came with red onion-shaved scallion slaw alongside. And while we’re on the subject of chicken, I do so hope that Chef Nguyen might eventually import the incredible shoyu fried chicken that he used to cook at Rye into the Post Office Place menu. 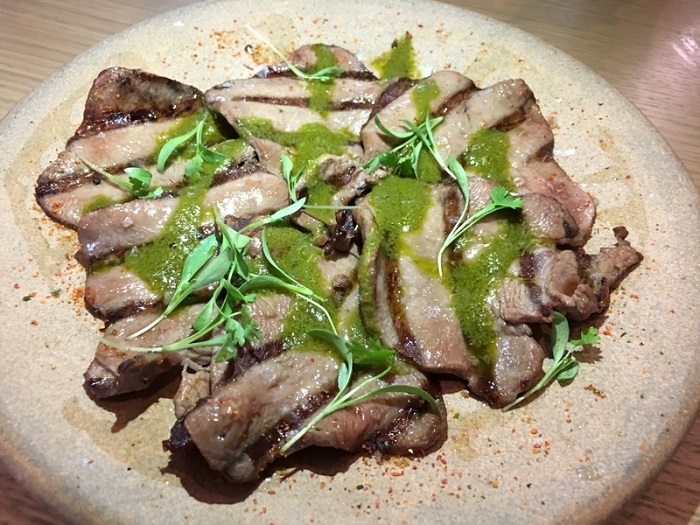 The Post Office Place menu is nothing if not adventurous, with menu items like Crispy Pig Ear, the aforementioned grilled beef heart, and a dish called Lengua Carpaccio ($12). This was thin-sliced “torched” beef tongue served with a tangy chimichurri sauce. I’d have preferred the beef to be slice even thinner than it was, especially (again) when eating it using chopsticks. The flavor, however, was outstanding. Equally outstanding is a top-notch staff of seasoned pros like our server Angie (formerly of Copper Onion) and Rich Romney, one of the best general managers around. 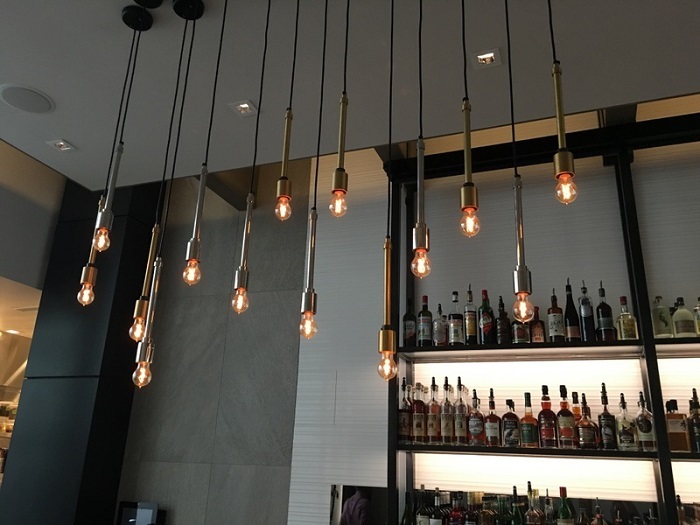 So sure, you could enjoy a bite and a sip at Post Office Place while awaiting a seat at Takashi. But, trust me on this: At some point you’re going to want to visit Post Office Place specifically for the food. This place is so much more than merely a bar, even in a town where bar fare has already been kicked up a number of notches.